Webster directors in the Western Region had their first annual conference last week, hosted by David Handrahan of the Luke Air Force Base location. The entire conference was filled with training as well as opportunities to brainstorm about new and innovative ways to reinvent extended campus operations, with participation via WebEx from key departments in St. Louis that presented cutting edge information as well created an open dialogue for directors to share. 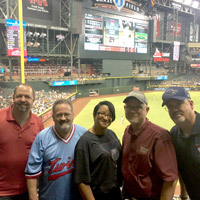 A few took in an Arizona Diamondbacks baseball game with Handrahan. Pictured above from left to right: Cottam, Coleman, Neal, Houth and Handrahan.